Slanted 3—Now For Sale — Blog — TypeOff. 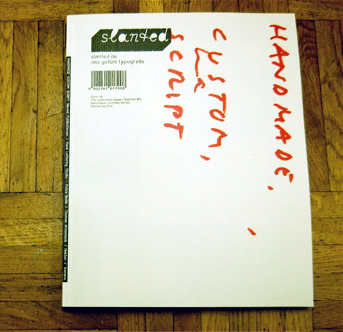 Cover of Slanted #3: Handmade Custom Script, the second issue of the German typography magazine Slanted to be released this year. My copy of the newest Slanted just arrived in the mail. Like the last issue, this one features an article of mine. 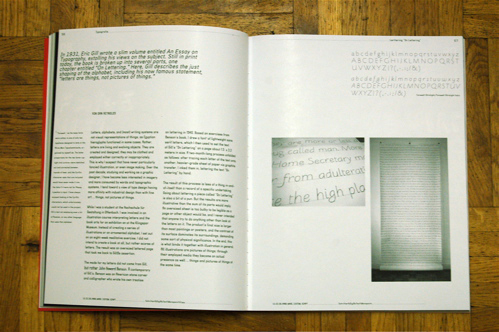 The article recaps a lettering project I undertook in 2004 at the HfG Offenbach, which has been written up on TypeOff. twice, here and here. “Farewell Gill,” the article’s lead-in spread. The article, which was designed by the magazine staff, runs over two spreads. The second spread, containing more text and images from the project. ordered directly from FINEST/MAGMA in Karlsruhe, Germay. The magazine costs 10 euros, plus tax. Articles in the issue vary between German and English for their text. The magazine’s spine doubles as a table of contents. The second image on the inside front cover is a photograph of an envelope I sent to the Slanted editors this summer. Great photo survey illustrating stencil art. 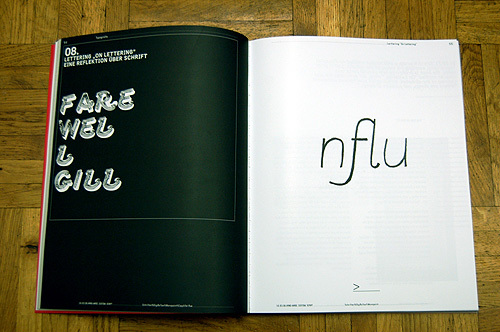 Article about the Typoart Freunde project, from students at the Bauhaus-Uni in Weimar.